U-pen is a portable writing tool designed for the blind. 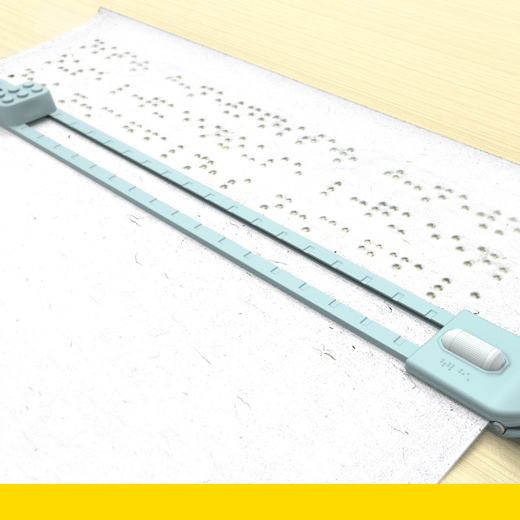 Currently, blind people use a stylus and slate to write, which are hard to use and difficult to carry. U-pen was designed to be a user-friendly "pen." It is a long slate that can be fixed on any A4 or smaller paper. Users press the buttons to type Braille letters. After typing one letter, they move the slider to the next notch. When the line is completed, they scroll the roller to move the paper upward and start typing on a new line. In the meantime, a click sound helps them locate the slate. U-pen also has Braille instructions on it to help people figure out how to use it. U-pen can make communication faster and more efficient for blind people.